I really cannot stress the importance of looking deeper than the index enough. Mistakes will be made....sometimes mistakes on top of mistakes. If something doesn't look right then you should be digging deeper. The Ancestry.com records of Joseph S. Cook provide the perfect example. I believe I have mentioned that his estate record is included in with another Joseph Cook but let me show you. This is the folder....I can tell you both the name and the dates are correct....but they are both also incorrect as well. Confused yet? Now let's look at the index card of contents. Do you notice anything strange? You would if you examined the Inventory of Estate Sale AND read the date on the will included. The Inventory & Estate Sale is recorded in Jan Term of 1839 while the will was written in Dec 1839 and proved in Feb Term of 1840. What you have here is a Joseph S. Cook who died without a will and W. C. Cook(my 2nd Great Grandfather) who was appointed admin to take care of Joseph S Cook's Estate Sale. ( The actual petition is in another record book.) The other papers including a will, deed and various other records are those of the estate of Joseph Cook of Davidson Co TN. The Davidson Co TN Joseph's estate is fairly extensive. His estate is finally settled in 1843. 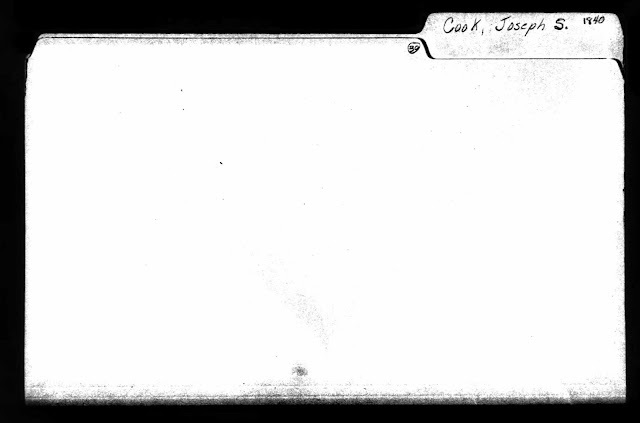 If I had only looked at the File Folder information and the index card I might have assumed that these were ALL Joseph S. Cook's estate papers given the closeness of the dates. 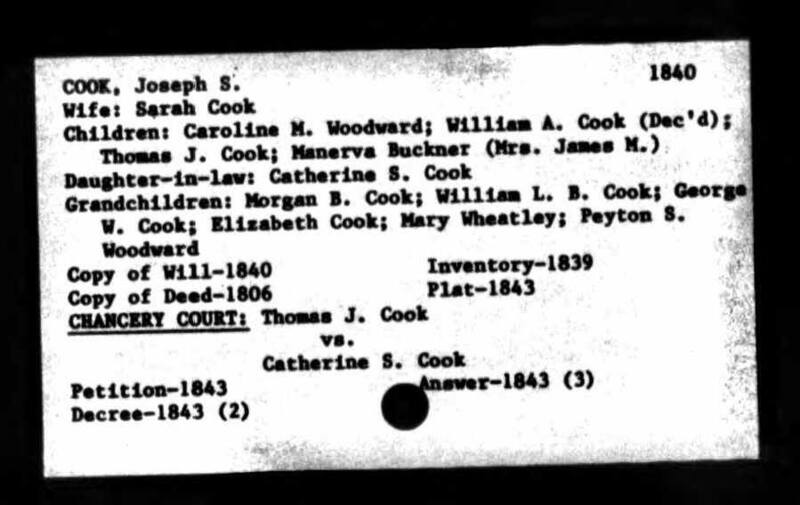 I find Joseph S. Cook(although he is not listed with the S. initial) in 25th Dist of Williamson Co TN in 1838...W. C. Cook is listed with him on the Tax List there although W. C. Cook is listed in Bedford Co TN(Rover Dist 10) in all other years. The Joseph Cook from Davidson Co TN is also listed in Dist 4 on Davidson Co TN's 1839 tax list...and wouldn't you know it....there is another Joseph Cook in Dist 2 during the same time period. I have spent the better part of the week looking at each of these and familiarizing myself with them and their friends, family, associates and neighbors. 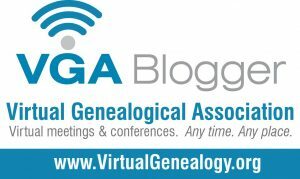 Speaking of which--if you have the opportunity to catch Elizabeth Shown Mills' presentation FAN + GPS + DNA: The Problem-Solver's Great Trifecta which was a recent webinar available thru Legacy Family Tree Webinars, I highly recommend it. The case study is mind-blowing and very inspiring. This week I was contacted by a DNA match. She went on to tell me that her file was at GEDmatch and that we had in the range of a 4.7 generation match. The first thing I always do after being contacted by a match is to run their One To Many and then do a Find within page for my email address. I did this and found mine in the 4.7 range. Hit next....and surprise. Mom and my sister match her at 6.7. Of course this means that I need to run the One To One comparison for each of us to this match and see what is going on. Upon doing that for both Autosomal and X I can tell you why I match more than my sister matches. My best guess is this. On Chromosome 4 that is a match from my Dad's side that my sister didn't get. On this portion of Dad's side I also match a Morrow/Sutton cousin. I should also note for later research that since my sister doesn't match this on this segment to the Morrow/Sutton cousin which is from my PGM side...that my sister on this segment of her DNA from Dad got the part that Dad got from his Dad(PGF). Ran the One to One of the Morrow/Sutton cousin and my DNA match and they also matched which I was 99% sure they would. My sister appears to match her on the end of Chr 4 but at less than 5 cMs so I believe that is noise from colonial lines. On Chromosome 5 you can see the smaller match at just under 9 cMs between my sister and Mom.....a segment which I didn't get.from Mom. If I had already identified which side of Mom's that I got this section along..I would know that my Sister got the one from the other side of Mom's lines since we do not match. Another clue is found with the 5.38cM match that both me and my sister share with this DNA match on the X. Mom doesn't match this and I tend to believe it is most likely from Dad's side.. If so ..this will provide me with more clues as the X has certain inheritance patterns. I have looked back along My current theory is that this line is from Dad's side and that this and the segment that I have on Chr 4 is from the Craigs and or Knox line as this line is one further down the Morrow/Sutton lines. Things to think about....If my sister had been the only one who tested for my family we would have totally missed the Paternal connection and likely written the Maternal match off as being too far back. Thankful that my sister tested because while we have a good deal of matches in common we have more that we don't have in common than I thought we would. I guess when you get out beyond 3rd cousins that happens even in ones that are heavily colonial. Something else that is very interesting. This DNA match has mostly Canadian ancestry....could their be a Loyalist in there somewhere? This shows how Mom's kit, Dad's phased kit using mine(Mine minus Mom's DNA) and my sisters kit all match the DNA cousin that contacted me. Dunham & Pittman descendants among those applying on Baker Roll. While working on the Pittman/Adcock portion of my 2GrGP to 2C project I have found applications for the Eastern Cherokee(Baker Roll era) ...not the the Pittman line but through the Dunham line..both were rejected but contained a great deal of detail about their migration. I thought it might be interesting for others to see what a basic rejection letter looked like and the reasons for not recommending the applicant be accepted as a member to the Eastern Cherokee. Items 1-6 were checked on the two applications for the John Sebron Dunham and Margaret "Peggy" Pittman Dunham descendants. 1. The applicant's ancestors have not been enrolled as members of the Eastern Band of Cherokee Indians. 2. The applicant or parents not in the state of North Carolina at the time of the Award October 23, 1874. 3. The applicant, or parents not enrolled in 1868 or since that date. 4. Proper degree of affiliation and association with the Eastern Band of Cherokee Indians. 5. Not recognized by the tribe as a member thereof. 6. No contribution made to the purchase of the Qualla Boundary or other tribal lands. 7. The applicant, or parents enrolled as Western Cherokees. 8. Any right the applicant, or an ancestor, may have acquired by reason of residence in the state of North Carolina in October 1874 or by reason of enrollment with the Eastern Band prior to that date has been lost through non-affiliation. 9. The parents of the applicant, one of them being white, married since June 7, 1897, and the applicant born apart from the Indian community. Thirty days is allowed in which to appeal to the Secretary of the Interior from this decision. Any appeal taken must be prepared in proper form and filed in this office so that all the paper in the case may be forwarded at the same time. The committee has no forms for use in making appeal and no information as to the method of preparing the same. Found this document while I was trying to find a common ancestor in one of my DNA match's trees. I thought it was so interesting that I couldn't resist sharing. Wish I could find something like this in one of my my lines. The full image file is available at Ancestry.com If you aren't a subscriber your local library likely has access to Ancestry which you can use while at the library. Then was the within plans of the division of Godfrey Fowler's land returned to the court having been duly executed agreeable to an order of said court and ordered to be recorded H. Lane C.C. Recorded in the clerks office in the County of Wake in the Book D and Page(283 & 284) this 26th day of July 1797 H. Lane C.C. I had some New Ancestor Discoveries that showed up this past week on my AncestryDNA test. The New Ancestor Discovery feature is still in Beta and I haven't really found it to be useful. These were a Shipman and McFadin couple and the father of the Shipman. I have marked the New Ancestry Discoveries with an M if they are ones which also appear on my Mom's AncestryDNA test. They others and the new ones I have marked with a P(for Paternal) to note they are not ones I share with my Mother. On first glance this doesn't really give much hope as this couple was born in the mid 1800s. My Grandparents were born in the 1880s & 1890s. and I have most of the direct lines back to my 4th great grandparents with the exception of my Cook(e) line which I only have proven to the 2nd Great Grandfather who was said to be born in NC in 1811. Upon further examination of the couple I could see that they had people in early Bedford Co TN which is where my Dad's ancestors were early on in Tennessee's history. It looks like the Shipmans were all listed as Chisums in the 1830 of Bedford Co TN. Do not know why but see them in tax listings as Shipmans all other yrs. Near them are Landers, Walker, and Turner families. I should also mention that there are Shofners also on the same page. I mention this because I have noticed matches with descendants of Martin Shofner. There are also some Prince families on the next page(My Prince line married into the Putman line and was from Union Co SC). I looked at the wife(Sarah Samantha McFadin) and worked her lines back to her grandparents. Bingo.....Her Paternal Grandmother is a Sally Brandon and a sister to my Nancy Brandon who married John King(they are my 4th Great Grandparents). This may or may not be the connection but it possible. The parents of Sally and Nancy are Charles Brandon.......and possibly Sarah Cook which further complicates this as she could be from my Cook line. This is a great argument for friends associates and neighbors research as well as cluster genealogy. Families traveled together. In colonial times and even up to the turn of the 20th century ...many people traveled in groups. Families that had intermarried ...usually of the same faith as well. Another cool thing about this New Ancestor Discovery is that in the grouping of what can best be described as the precursor to the Ancestry Circle(which groups together matches who have common ancestors with you in their tree) was that there was a group with which I share a rather large segment. What's next...I will be looking more for more available records in Bedford Co. TN and the other areas in which the Brandon, Shofner, Landers and Shipman families lived. Hope to have more information to blog about from that.